In this section, you will learn what bloodborne pathogens are and how they can enter the body. It is important to know this to prevent transmission of bloodborne pathogens and minimize the risk of becoming sick for yourself and others. 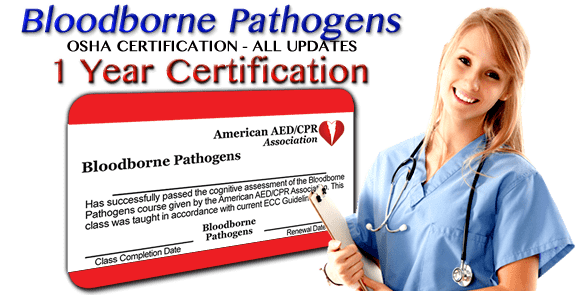 Why do you need to know about Bloodborne Pathogens? In your field of work, you may come across blood or materials that contain blood, such as vomit, saliva, or sneeze droplets. Blood may also be found on non-living objects such as needles or other medical equipment. In this course, you will learn how to prevent exposure, and how to minimize the risks of becoming sick in the event of exposure. ● List of all job classifications that have a high chance for exposure to blood. ● List of all procedures in which occupational exposure may occur and that are performed by employees in specific job classifications. ● Rules to protect employees. ● Rules for human immunodeficiency virus (HIV) and hepatitis B research labs and production facilities. ● Vaccination, post-exposure evaluation and follow-up for Hepatitis B.